Apparently Friday was pretty much useless to evaluate anything for the weekend, not just because of the rain in FP2. Really sour comments from Alonso recently (and Button), so love that comment from Manor! Couldn't watch this and youtube let me down. Doesn't look too bad (except for the Mercedes gap). I hope Lewis is still in attack mode and doesn't plan to mail it in for the last races. As for Grosjean, I feel as though everyone (quite unfairly) sees Maldonado as a rubbish driver and therefore, no one really bats an eye to Grosjean's dominance in the head to head qualifying battle. On the other hand, Maldonado has had terrible luck this year, but no one seems to give that fact any recognition. Already 4 drivers out of the running, among them the Nicos. No matter how you slice it: Vettel is just faster than Kimi at just about every circuit. Can't complain: Lots of on-track action here, camera work looked fine to me! It's a shame we were deprived of the Nico/Lewis duel. Pretty pictures there from Kimidonado! Taking out Bottas. Lol, Vettel ALWAYS wants the fastest lap! Vettel now 2nd in the standings, 7 PTS ahead of Rosberg. Bottas and Massa within 2 PTS again. Lewis and Vettel now even with 42 wins! Vettel got the fastest lap? Must have been last lap then, as Kimi had a hold onto fastest lap couple laps before end. I found this race way more exciting than the one last year, so all good. Shame about Finn taking out Finn, but that is racing. Some mild excitement in Sochi this year! Crazy move from Raikkonen, I expect him to get a big time penalty and maybe a grid penalty for the next race. On the other hand, great to see Perez on the podium! The championship is virtually in Hamilton's hands now. Would love to see him finish 9th in the next race lol. Frustrated with Kimi's performance overall really. Finally had track position over Vettel and couldn't do anything with it. Both McLaren in the points! Nice inheritance for a team that had already written off this weekend before it started. Considering Ferrari's gains over last season, is there any reason to believe they don't overtake Mercedes next season? Just watched the MotoGP race...found it ok, but not exactly thrilling. The overtaking moves looked unspectacular...like teamorder. They basically just showed the first 3 riders all race, and it's not like there was THAT much going on there. Everyone pretty much doing their laps on their own, with Pedrosa overtaking guys without any resistance whatsoever ("after you, Sir!"). I guess Yamaha is MotoGP's Mercedes, with their riders dominating the standings (even if Pedrosa won this one, but he's only got about half the points of the championship leader and it was his first win). Now, I'll watch some more races to get into this more (watched quite a few last season), but at least for today, I enjoyed the F1 race a whole lot more than this. Put Vettel in the Mercedes next to Lewis, and the fight for the championship would also be a lot closer in F1. 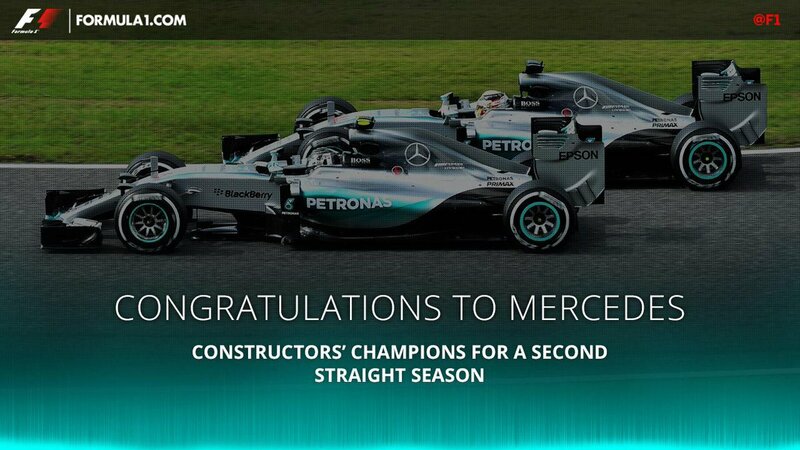 Congrats MERCEDES GP! Well-deserved constructors world champion! Kimi gets punished as expected - 10 seconds stop-and-go penalty turns into a 30 secs time penalty (loses 6 PTS). F1 forever a écrit: Considering Ferrari's gains over last season, is there any reason to believe they don't overtake Mercedes next season? Yes, every reason not to believe it.... Mercedes are not standing still and they didn't need to be that much better this year.. I predict next years car (already well into development) will maintain the gap. The cars have become a lot less reliable and even seem fragile despite not being truly challenged on track (listen to Wolff after just about every race)...you could argue it is because they're already testing stuff for next year, but I'm not convinced. I don't see how they would maintain the gap, but we'll see! All that is assuming that the rules don't change much for 2016. Their cars do seem fragile but then again there were plenty of occasions last year too..
days of testing are allowed.